The concept is a simple one. One of the main goals of the editing process should be to tighten your language. Readers are busy people. A fast way to take them out of your story is to make them stumble over unneeded words. That’s where the reverse dictionary comes in. Unlike a normal dictionary, wherein you look up a word to find its precise meanings and usage, with a reverse dictionary you start at a concept and use the tool to find a more concise or precise way of stating it. Let’s look at a real editing example. 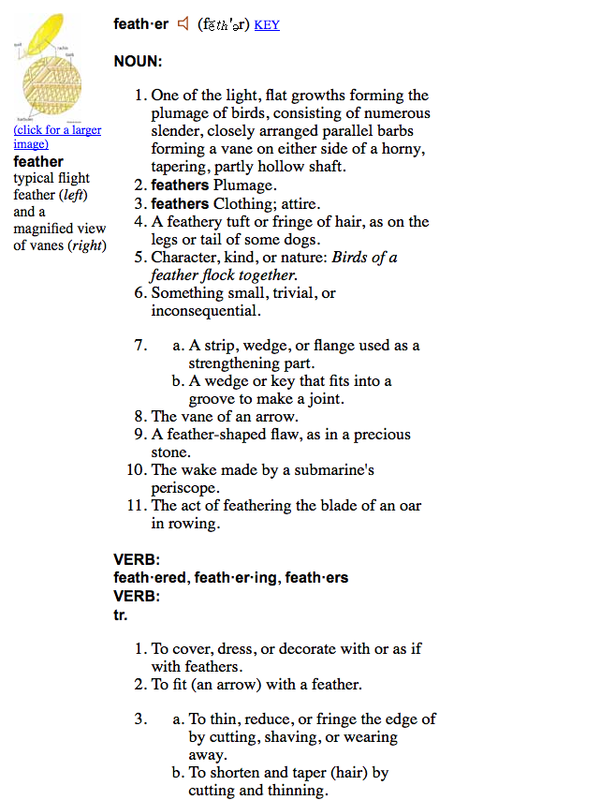 The tool is sometimes hit or miss, but right away, the 2nd verb strikes me: “feather.” That’s a possibility. 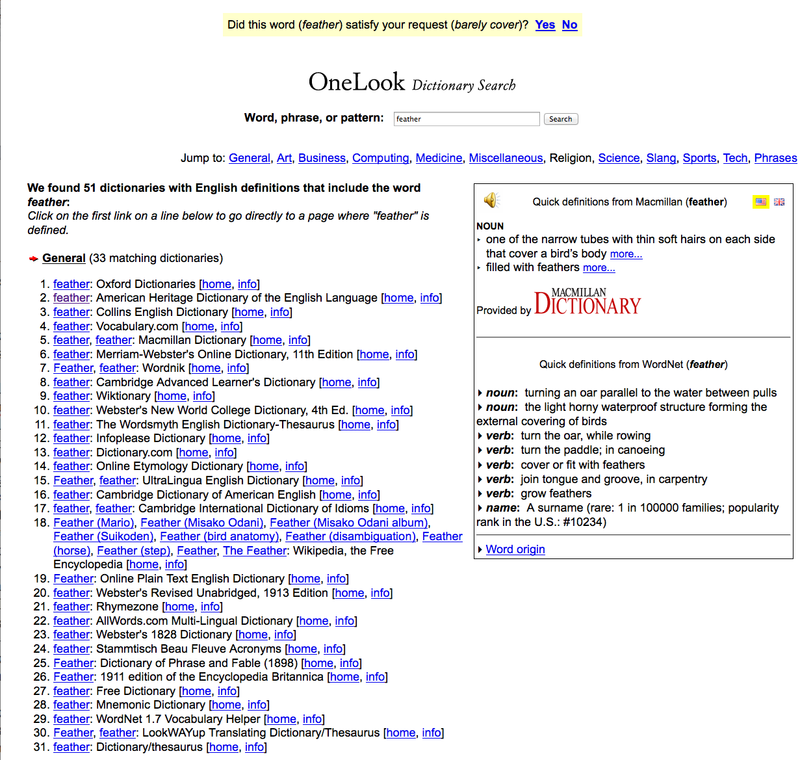 I click on the word, which takes me to a set of dictionaries that I can use to verify my choice. “Her hips were feathered by a tiny, asymmetrical skirt with a split to her waist. Much better than the original sentence–it’s more visual and 4 words (21%) shorter. 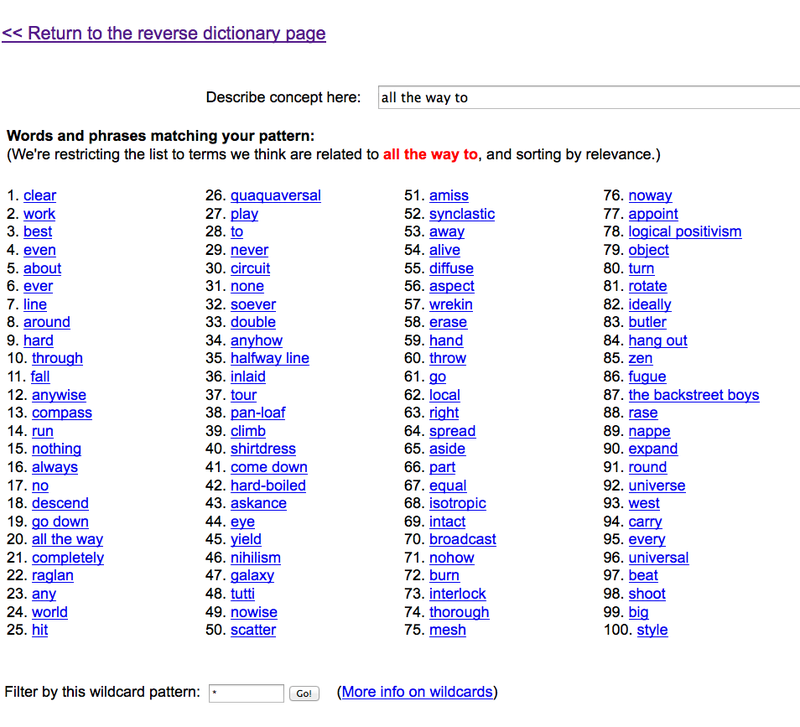 Try a reverse dictionary and let me know what you think. Interesting. 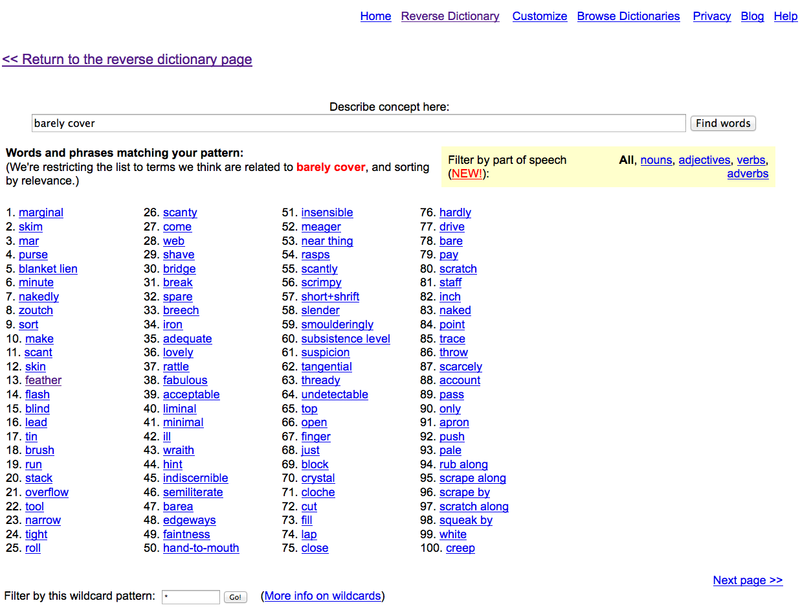 Never heard of the reverse dictionary before. I shall bookmark it and check it out. While I also try my best to avoid a lot of adverbs, the alternate word, feathered in your example would not have occurred to me in a million years and I’d be inclined to ask, would one use this word in this context? I’m pretty I would have made an exception about the adverb usage and kept barely, or found a similar word or restructured the sentence. But as an exercise it most certainly makes one think as a writer, and this can only be a good thing. Donaldson used the word ‘bifurcated’ in his Thomas Covenant novels and because it is such a stand out word, and he ( in my opinion) overused it, it stuck. I cannot even see the word without thinking of The Chronicles of Thomas Covenant. Pratchett makes a tongue in cheek reference to odd word usage in one of his novels when he mentions the words ”Rumpus” and ”Fracas”. He reckons they are journalistic words that never get used in normal conversation. He says they are like the word ”Beverages”, which only ever appears on menus! I agree with you in most instances, and I retch when writers use arcane words just because it makes them sound clever. In most cases, and especially modern writing, it would be better to stick with “barely covered” instead of feathered. I used feathered specifically because I wanted a word that would create a sensory image in the reader’s head. Plus, I wanted the idea of lightweight or sheer rather than small. I had a friend who would use “bifurcate” All The Time. Never split, never forked, always bifurcated. I didn’t even know what it meant. I wanted to bifurcate his face. I was going to say you could use ”just covered” but remembered this was one of those words you hate too. I actually overuse “just.” I’m trying to get rid of it in my head.